If you've been to a casino before you've probably noticed the loud crowd around the craps table. You may have avoided this table in the past as the excitement of the player, the speed of the game and the strange language spoken at the table may have been a little intimidating. Keep reading and you find craps is actually one of the simplest and most exciting game at the casino. 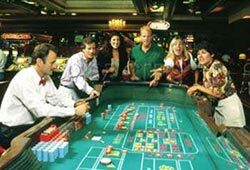 Craps is played on a specially marked craps table using a pair of identical dice. The opposite sides of each die will always add up to seven - 1 is opposite to 6 and 2 is opposite to 5, etc. The game is based on the number 7, which is the total which turns up more frequently than any other when the dice are rolled. The person who throws the dice is called a "shooter". If they throw a 7 or 11, its called a "natural. If they roll a 6, 7, 8, 9 or 10 it's called a "point" number. If a 2, 3 or 12 is rolled its called "craps". The most popular and some say the most profitable bet is a "pass line" bet. If the shooter rolls a natural before a point is rolled, all the pass line betters win. If they roll craps all the pass line bettors lose. If a point number is rolled, the shooter must roll the same number again before the 7, in order to win. As always, it's a good idea to watch any game before you play, to get comfortable with the game and pick up a tip or two. Craps is based on the number seven and how all other totals relate to it. There are 36 different possible combinations and craps is played depending on how often these other combinations appear. The payoffs for your bets are based on the number of times a particular total will appear. For example, a 7 will roll 6 times out of 36 rolls and a 6 will roll 5 times out of 36 rolls. The odds of a 6 rolling before a 7 is 5:6. If you bet $5 on 6 and it appears before 7 then you win $6 for your $5 bet. Don't worry about memorizing all of these odds and ratios. You can just ask the dealer and they'll tell you the payoff for each bet. There are a number of betting strategies out there for the game of craps. One "sure fire" way involves placing multiple bets on the pass line, craps and the point numbers. Here's what to do. Place $1 on each of the craps numbers 2, 3 and 12. The payoff is $30 (30:1) on the 2 and 12 and $15 (15:1) on the 3. Place $40 on the pass line to protect you from a 7 or 11. Place $5 on the 4, 5, 9 and 10 and $6 on the 6 and 8. Make sure your bets are on for the come out roll and a 7 will no hurt you.. This is a fairly safe strategy. It shifts burden of losing from the 7 to the 3 which is much less likely to appear than a 7 - 6:2 odds in fact. Keeps these rules and tips in mind and you'll not only have a great time at the craps table, but quite possibly a profitable one as well. Try to find a European game, it only has one zero and smaller house advantage. Don't rely on mathematics or any mathematical system to play roulette. No systems have ever been proven to work at predicting the outcome of a spin of the roulette wheel. Still if you think you have one that works, use play a free game to try it out. Anyway, if mathematical systems did work, then it wouldn't be gambling would it? Always know when to quit. If you are having a bad day, quit and cut your losses. You can always come back another day. Always consider probability but don't rely on it. It is only a rough estimate of what to expect in the long run. Don't be influenced by previous results. Like lotteries, the odds always reset with every play. Don't forget the biggest factor that will determine if you win or lose - your luck!